With integrated electronic systems and complex computers running vehicles, the job responsibilities of automotive service technicians have evolved from mechanical repair to a high technology career. 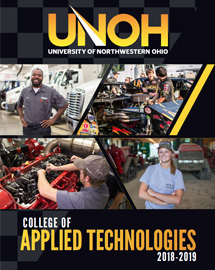 The UNOH College of Applied Technologies offers diploma, associate, and bachelor degree programs in Automotive Technology. These programs will give you the training you need to not only diagnose and repair the automobiles of today, but the automobiles of tomorrow as well. The UNOH Automotive Technology program is the best in the country for many reasons. 70% of the coursework is hands-on and will have you rolling up your sleeves either in the classroom or in the shop. Our ASE and Master ASE Certified instructors bring real life experience to the classroom and share the same passion for the automobile as our students do. Our students train with the newest tools, on the latest equipment, found in dealerships across the nation using the most modern equipment, from Snap-On to Hunter, Summit and many more. We are constantly updating our curriculum to stay current with the latest developments from all the O.E.M. 's and manufacturers of aftermarket equipment. As a student of the UNOH College of Applied Technologies' Automotive Department, you will begin your training by learning basic theory and operation before advancing to more complex areas. Knowledge-based and performance-based courses are carefully integrated to provide a well-balanced education, utilizing our 90 different vehicles from all the major automakers. Plus, there is a Mustang 4-wheel dyno on campus that students will operate during certain classes. All of our students have the opportunity to take ASE tests to become ASE Certified an industry-wide certification of excellence. As a benefit to you, the University will cover the cost of up to two ASE tests for each student. 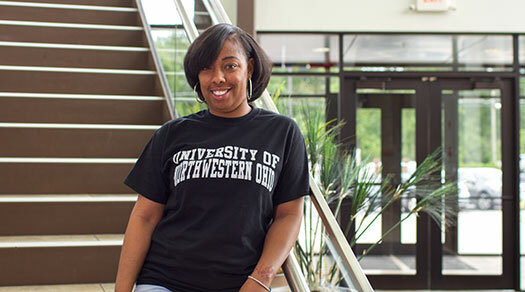 *Percentages are based on surveys of our 2013-2015 academic year automotive associate degree graduates who reported they are employed or are continuing their education within 6 months of graduation from the University of Northwestern Ohio. There was a 71% response rate to this survey.